Social media posts featuring an old photograph showing two former Prime Ministers PV Narasimha Rao and Rajiv Gandhi among others at a funeral claiming the photo was taken at the funeral of Indira Gandhi, are false. 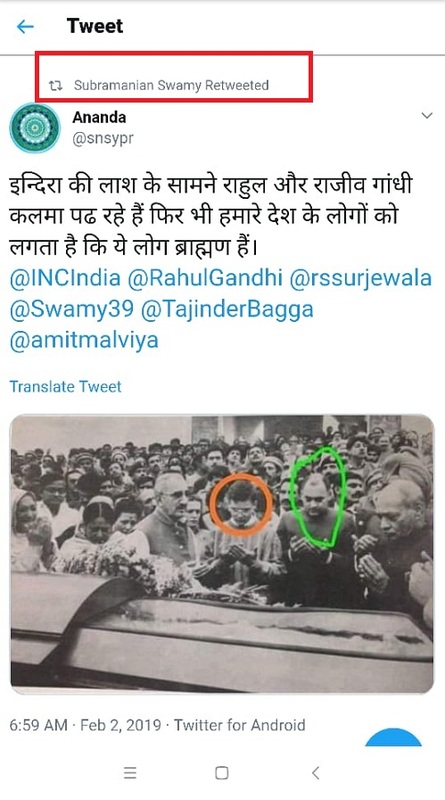 The image also shows Sonia, Rahul and Priyanka Gandhi and also includes P Chidambaram, who can be seen in the background on the left . The photo is going viral on social media after some netizens pointed out to the manner in which Naramsimha Rao’s palms are joint together as opposed to members of the Gandhi family, while praying during the funeral service. The image is being shared fueling an old conspiracy that the Gandhi family have always hidden their Muslim identity. The photo was revived by a Twitter user on Thursday and even picked up by fake news Hindi website Dainik Bharat. Click here to view an archived version of the story. 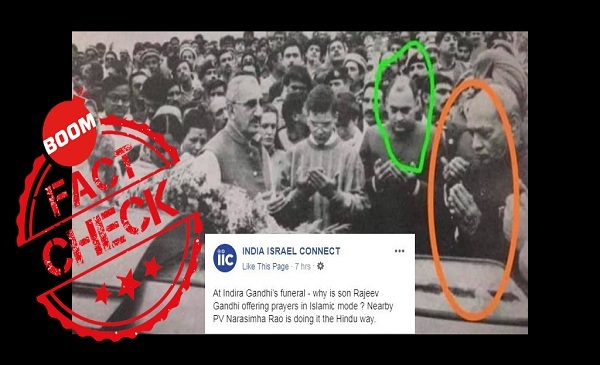 While the initial tweet did not claim that the photo was taken at Indira Gandhi’s funeral, it is now going viral on Twitter and Facebook with the misleading claim. A tweet claiming the same was also retweeted by Bharatiya Janata Party MP Subramanian Swamy. The image was shared over 100 times at the time of writing the story. BOOM did a reverse image and found two links that matched the photo online. We found a tweet by Mohsin Dawar a politician in north Waziristan. freedom fighter Khan Abdul Ghaffar Khan better known as ‘Frontier Gandhi’ or Bacha Khan, in Peshawar on January 21, 1988. The image appears to be from a book. Ghaffar Khan who died at the age of 98 had suffered a stroke six months before his death on January 20, 1988. 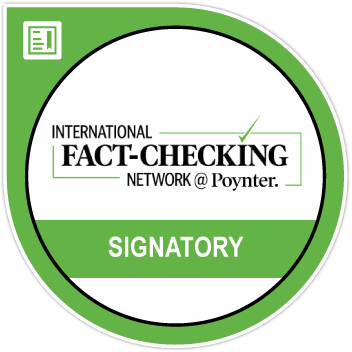 We also found news articles including those from the New York Times. 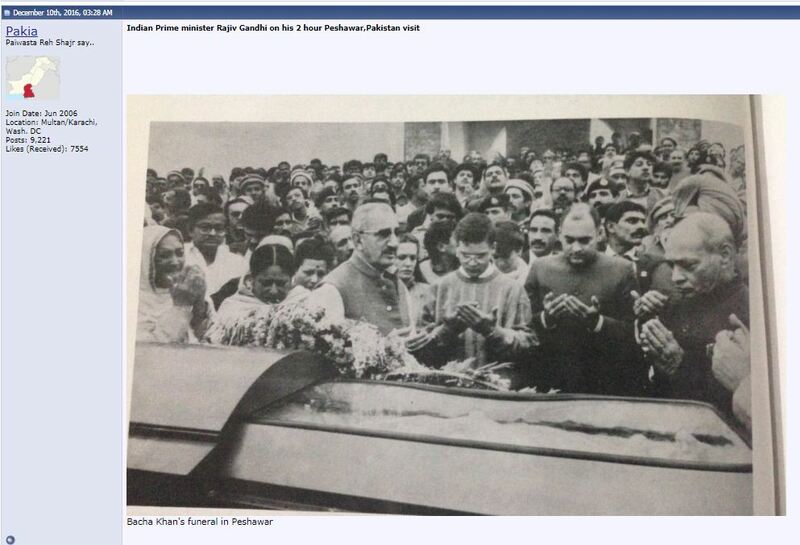 and LA Times, which confirm Rajiv Gandhi attended Bacha Khan’s funeral along with a few members of his cabinet and family. Below is an excerpt from an archived article by United Press International. “Prime Minister Rajiv Gandhi became the first Indian leader to visit Pakistan in 28 years today, flying to Peshawar to pay last respects to a leader in the fight to end British colonial rule of the Indian subcontinent four decades ago. We also found a video on YouTube that includes a colour photograph showing the same scene from a different angle. Khan Abdul Ghaffar Khan, better known in India as ‘Frontier Gandhi’ worked to end the British rule in the sub continent and for the interest of his Pashtun tribesman. A towering figure, literally and figuratively, he was a close friend of Mahatma Gandhi and a lifelong proponent of non-violence. He spent several decades in British and Pakistani prisons and in exile. Indira Gandhi was cremated in keeping with Hindu customs on November 3, 1984. She was assassinated by two of her bodyguards on October 31, 1984.